Eastbourne Borough will face one of their most important matches of their recent history this Saturday as they prepare to welcome Gloucester City to Priory Lane. 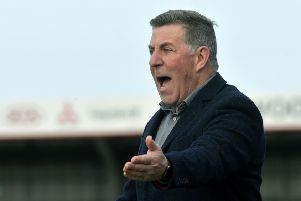 A last gasp and painful 3-2 loss to Hemel Hempstead last Saturday leaves Borough 17th in the table and desperately in need of a victory against Gloucester who are third from bottom - just three points behind Mark McGhee’s men. Borough’s last win was January 5 at Chippenham and McGhee is yet to record a victory since taking over from previous manager Jamie Howell. Since the Glaswegian arrived, Borough have drawn three and lost three. Last Saturday, Daniel Isaiah Rowe gave Hemel Hempstead the lead before a double strike from Charlie Walker gave Borough a 2-1 advantage. Arel Amu made it all square on the hour and a late strike from Jordan Parkes sealed the win for the hosts. Painful for Borough. With five matches remaining, Gloucester, at Priory Lane, becomes huge for the Sports - especially as the their next two matches are at leaders Torquay and then against sixth placed Dartford. Slough away and finally Concord Rangers at home make up the final two fixtures.